I guess I am quite at a loss trying to follow Primordial Tradition, erm… Numen Books, or was it Manticore Press? Also the website changed a couple of times and there are several channels on Facebook. So by the time I heard of Gwendolyn Taunton’s latest book called Tantric Traditions, I discovered that by then I had missed two volumes in the Aristokratia series and a book called Operative Traditions. Time to catch up! Aristokratia is the more political branch of the series of journals. 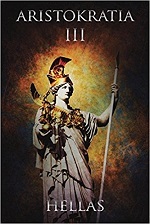 This third volume is subtitled “Hellas”, so in most essays you will run into Plato and Greek democracy, but there is also a lot of Evola, Nietzsche and a few texts that have nothing to do with either Greece or politics, probably texts that fitted better in this journal than in any of the others. Politics, not entirely my subject. As expected there is a lot of criticism towards democracy, contemporary culture and society and, as the title of the journal suggests, a (new) aristocracy that has to be built in order for the world to survive. The most interesting article is one of the ‘out of place’ texts and speaks about how Mircea Eliade actually saw Traditionalism, Guénon and Coomaraswamy. Eliade is often seen as a Traditionalist (light), but this is a bit of a one-sided view on the man it seems. From ancient politics to more recent ones and even a manifesto to build a new form of society, these are the subject that you will find in this journal. The more ‘practical’ side of contemporary Traditionalism so to say. As I said, not the most interesting of the Manticore journal series to me, but it is always nice to read newly written texts of living persons with unpopular ideas. Volume IV lays ready to be read, so await a review of that one later on.